The holiday season gets us in the giving mood. Along with family members and friends don’t forget those who really need your help. A gift to your church or your favorite cause is the perfect way to give back to your community and provide help to those who are less fortunate. When giving most people just write a check. This is by far the most common way to give but it may not be the most advantageous for you. Why not help yourself while helping others? 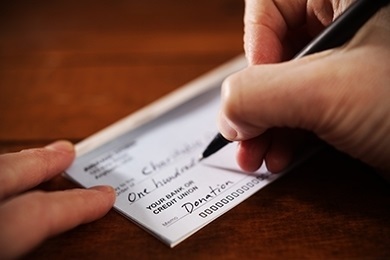 There are many tax strategies that can lower your tax bill when you make a gift to charity. The best method of giving varies depending on your income and the amount you wish to give. I will just go over a few of the most common ways to save some taxes while giving back. Check with your own tax advisor for the giving strategy that will work the best for your situation. Donate Appreciated Property. Donating appreciated property to a qualified charity is by far the most common tax advantaged way to give. A charity can sell property they receive and pay no taxes. So if you have 100 shares of stock you bought for $2,000 and it is now worth $10,000 you have a $8000 gain. If you sold that stock and then wrote a check to the charity for $10,000 you would owe capital gains taxes of around $1,600 on the gain. You would be $1,600 ahead just to donate the stock instead of writing a check. The greater the appreciation the bigger the tax savings would be. A charity pays no taxes so they will sell your stock for $10,000 and keep it all. This works with most any kind of appreciated asset including real estate. Qualified Charitable Deduction. This tax strategy only applies to older people with IRA accounts. Once you turn age 70 ½ you must take a Required Minimum Distribution (RMD) from your IRA every year. That amount is normally all taxable income taxed at your ordinary income tax rate. If you don’t need the distribution for living expenses and you want to make a gift you can instruct your IRA custodian to make your RMD check out to a qualified charity, this is called a Qualified Charitable Distribution (QCD). It is only a QCD if the IRA distribution check is made out to a qualified charity. It cannot be made out to the IRA owner. The main advantage of the QCD is that you can use your RMD and donate it (or part of it) to charity. The RMD goes directly to the charity and you pay no taxes on that amount. For the average taxpayer this is usually a much better deal than taking an RMD paying taxes and then writing a check to a charity. But again check with your accountant. Under some circumstances like higher income donors with larger RMD’s a charitable deduction itemized on your tax return may be more advantageous to the donor than a QCD especially if you are making other large gifts in the same year. Donor Advised Funds. A Donor Advised Fund allows you to make a contribution to the Fund this year, get the tax deduction now and make recommendations for distributing the funds at a later date. You don’t have to donate huge amounts of money to take advantage of these Funds. Several discount brokers like Vanguard, Fidelity and Charles Schwab and other organizations offer Donor Advised Funds through their foundations but I would recommend a more local organization like the Kearney Area Community Foundation. A local foundation is deeply involved in giving in the local community and spends a substantial amount of time getting to know local charities. They will facilitate the gift and if you need help deciding which charities best fit with your passion for giving they can get you all the information you need to make good choices. A Donor Advised Fund can be a good strategy to use if you get an unexpected bonus or realize you are going to have a really good year because you can make the gift now and decide on the charities you want to give the money to later. You can also donate appreciated assets to a Donor Advised Fund. And finally, if you want to make anonymous gifts generally a Donor Advised Fund is the way to go.